In March, we published a first story on visualizing hackAIR data. hackAIR users have started taking data visualization into their own hands – here’s an overview of exciting experiments we’ve found so far. A simple display using Kniwwelino. How to combine a small electronic device used in education with data from your hackAIR home sensors to build a simple LED display for your family and neighbours. Let’s compare readings from two sensors. How to use Google Data Studio to compare PM2.5 and PM10 readings for two sensors from yesterday. Larger date ranges need a better cache. How to use Google Sheets to overcome API limitations and store data to visualize larger time scales. 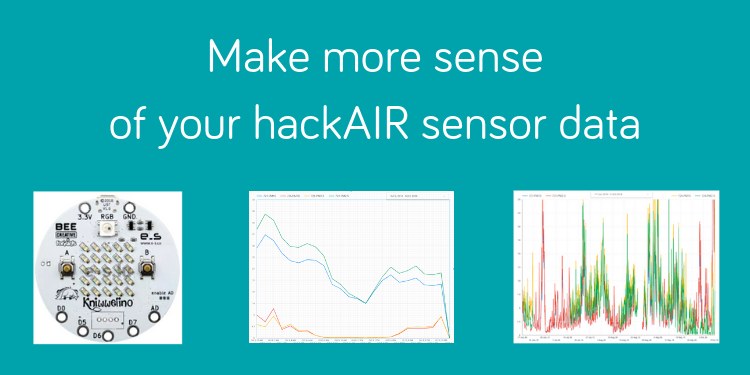 Happy experimenting with Kniwwelinos, Google Data Studio, Google Sheets and other tools for your (and our) hackAIR home sensor readings!